When you decide that you want to add sound to your movie, you must prepare this sound outside of Toon Boom Studio. Then, in Studio, you add a Sound element to organize sound files in your animation. A sound will play in the movie until it reaches the end of the file or a stop frame created in the Sound Element Editor. If the sound extends into multiple scenes, it will continue to play. You can import as many sound files as you like. However, if you will be delivering your movies over the Internet, the more sounds you add, the larger the file size of your final movie. Toon Boom Studio imports, exports and plays sounds using QuickTime. Studio only supports the sound formats recognized by Qt®, with one exception: Flash ADPCM format, which is supported natively. ‣ From the Sound toolbar (Top toolbar on Mac OS X), click the Import Sound button—see Customizing Toolbars on Mac OS X. ‣ From the top menu, select File > Import File. ‣ In the Exposure Sheet view, right-click on any cell and select Import Sound File. ‣ In the Timeline view, click on the Add New Elements button. In the dialog box, select the Sound type, name the layer and click on OK. In the Properties view, click on the Import Sound File button. ‣ In the Exposure Sheet view, in the top toolbar, click on the Sound button. In the Properties view, click on the Import Sound File button. The Open dialog box displays. 2. From the Open dialog box, browse for your sound file (*.aiff, *.mp3, *.wav, or *.m4a) and click Open. The sound layer appears in the Timeline view and is displayed as a waveform. The sound file also appears in Exposure Sheet view. Adding a lip-sync to a project can really enhance its quality and storytelling. However, it can be difficult to shape a character's mouth so it matches the sound at the precise frame. 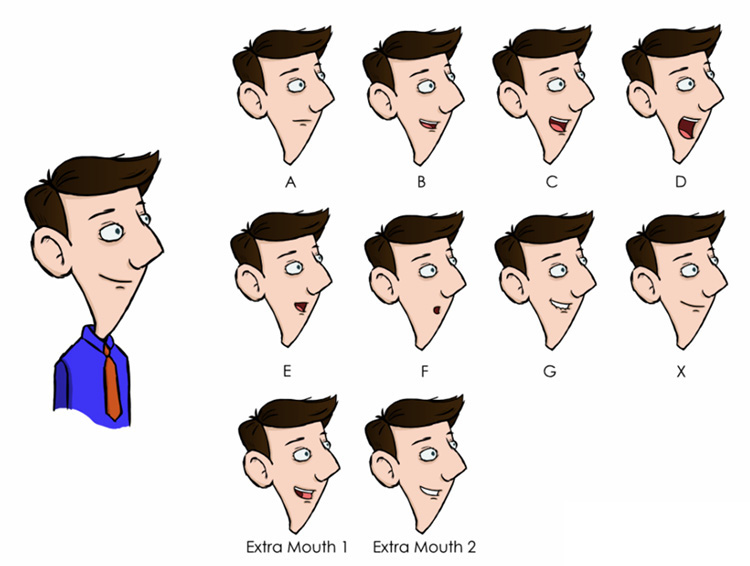 To solve this problem, Studio provides a lip-sync feature which analyzes the content of a sound element and generates a mouth chart based (see below) on the eight animation phonemes (A, B, C, D, E, F, G, and X, which is used to represent silence). You can lip-sync the traditional way or let the Studio automatically create the basic detection. 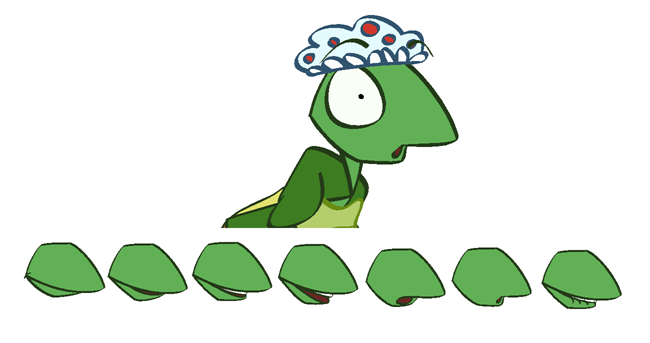 The mouth shapes used by Studio are based on the conventional mouth chart used in the animation industry. The letters used to represent the shapes do NOT correspond to an actual sound. You can refer to the mouth chart positions as you draw the shape of your character's mouth.